The image shows the Virgin Mary as the Help of Sinners. She chose two poor shepherds, fifteen years old Melanie Calvat and eleven year old Maxim Giraud, to pass on Her message, calling for people's spiritual rebirth. France is justly proud of its title "the eldest daughter of the Church." Since the days of Clovis, who together with his retinue accepted Baptism from the hands of Saint Remi, at some point between 496 and 506, thus making Gaul the first country after the demise of the Roman Empire to join the European Christian community: throughout the centuries its Church has played a crucial role in influencing the nature of universal Catholicism. The process took place on several levels: from close connections with the Holy See [as many as seventeen Popes have come from the territories which today constitute France], through the enormous significance of French philosophical and theological thought and a host of great Saints, to the cultural impact of Paris. French piety has always been strongly marked by its veneration for the Virgin Mary, particularly in the twelfth century, which became known as "the age of cathedrals," because of the many cathedrals built and dedicated to the Mother of God. It was also the time when the tradition of pilgrimages to Marian sanctuaries grew in strength. As early as the sixth century, worshippers began visiting Chartres, where they not only prayed beside the highly venerated statue of the Virgin, but also admired 'the stole of the Mother of God," offered by the Carolingian King, Charles the Bald. In 1935 French students initiated their increasingly popular annual pilgrimages from the Notre-Dame Cathedral in Paris to Chartres. Before Lourdes, le Puy was the most famous Marian sanctuary in France. In 1095 Pope Urban II set off from there to Clermont, to announce the first Crusade, when he was supposed to have said "The Kingdom of France is the kingdom of the Virgin Mary: it will never perish!" In the thirteenth century the act of dedicating his realm to the Mother of God was performed by Saint Louis, and repeated by Louis XIII four hundred years later. The veneration of the Mother of God found an even deeper expression in True Devotion to the Blessed Virgin, a book written by Saint Louis Maria Grignion de Montfort. The development of the Church in France was severely hampered by the revolution of 1789, which brought with it persecution of the clergy and destruction of many churches and monasteries, as well as many sacrileges and blasphemies. It also led to the permanent separation of the Church and State in French political life. For modern man it may be difficult to fathom why in the nineteenth century France was chosen as a place for repeated appearances of the Virgin Mary and her great proclamations, beginning with Paris in 1830, then la Salette in 1846, and finally Lourdes in 1858. The sanctuaries which grew up around the locations visited by the Virgin are now living centers of faith, where many people renew their belief in God, and the French Catholic Church struggles to regain its identity, weakened even more by the crises of the last few decades. Consequently, and not for the first time, the Catholic world finds itself greatly indebted to France, the eldest daughter of the Church. 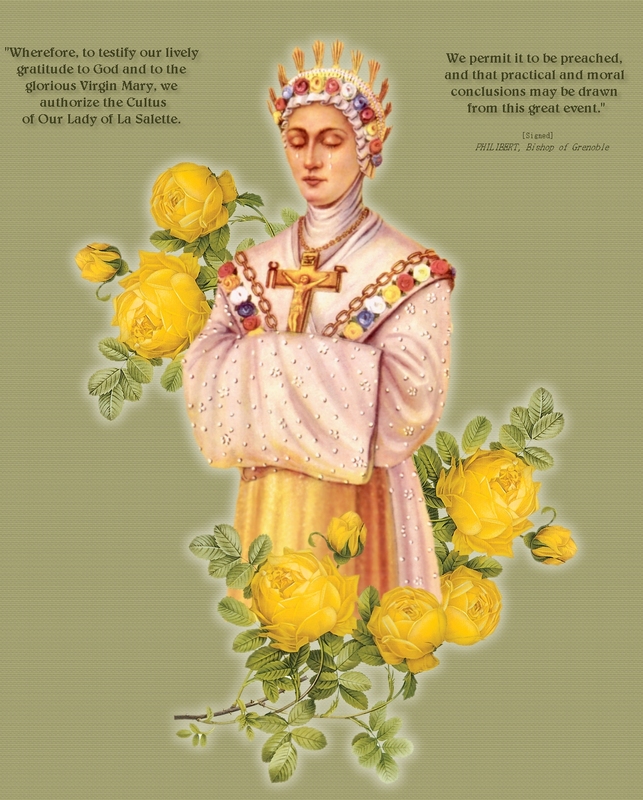 "'We judge that the Apparition of the Blessed Virgin to two cowherds, on the 19th of September, 1846, on a mountain of the chain of the Alps, situated in the parish of La Salette, in the arch-presbytery of Corps, bears within itself all the characteristics of truth, and the faithful have grounds for believing it indubitable and certain."